An assessment of Union Standard Health Insurance Company reveals Union Standard Insurance Group. Union Standard is a casualty insurance company operating in the Southeast and Southwest. Enter your zip code now to find health insurance rates in your region. The company offers insurance products to companies to cover property damage, losses from theft or other crime, business liability, company automobiles and workers’ compensation insurance. The company started in 1975. It is now part of Berkley National Insurance Company, a company that provides all kinds of commercial insurance and reinsurance of companies in the U.S. and abroad through its subsidiaries. Union Standard offers lines of insurance to businesses and companies. Their property insurance covers loss due to a fire, wind or other damaging effects. It also covers glass, equipment, or systems breakdown and income loss. The company also offers general liability and garage liability to cover the business if someone becomes injured on the property or an outside person damages the property. There is commercial auto insurance that covers a company’s vehicles or fleet of vehicles for liability and physical damage. In addition, marine inland insurance covers the goods that are transported by land or water, as well as the vehicles or boats transporting the goods, as long as it does not include ocean travel. Workers’ compensation insurance is another line that Union Standard offers, covering workers’ medical expenses, lost wages or death benefits if injured or killed while working. Union Standard also offers packages and umbrella policies to provide multiple lines of insurance or to extend greater coverage to a particular business or company. The company covers multiple types of industries; there are select industries that the company serves by tailoring insurance to meet the particular needs of that industry. Medical coverage is also available. Coverage options cover a broad range of property, equipment, and liability. Union Standard offers property liability insurance to hotels and motels. Options range from fine art coverage, to liability for guest property, to workers’ compensation insurance. Similar insurance options are available to public and private golf courses as well. There is even an option to cover the expense to a golf course that offers a prize for golfers who get a hole-in-one! Union Standard also offers liability management and risk assessment services to companies. The company works to provide a personalized strategy to help any business to calculate and minimize risk and loss from accidents, injuries, and hazards that threaten a business’ profits. 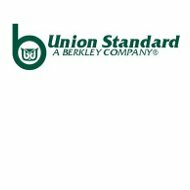 A.M. Best, an agency that rates the credit and financial strength of insurance providers, rated Union Standard’s parent company, Berkley National, at an A+ or Superior. This designation shows that A.M. Best has faith in the company’s financial ability to continue to honor its insurance underwriting. Standard and Poor’s, also gives the parent company of Union Standard a high rating. They rated both the company’s financial strength and credit rating at an A+. Standard and Poor’s believes that the company is strong financially and is able to meet its financial commitments. The Better Business Bureau, ranks W.R. Berkley Corporation, the holding company for Berkley National and Union Standard, at an A+. The BBB is an organization that tracks companies’ customer complaint resolutions and ranks the companies to provide a gauge for consumers. An A+ is the highest ranking given by the BBB, citing zero complaints filed for the company in the last three years. Branch office addresses and phone numbers can be located on the Union Standard website, on the Contact Us page. There are also email addresses to reach particular departments, such as billing, claims, or human resources. Use your zip code to get a health insurance quote now.